We are absolutely delighted that our co- director Maggie Sargent has been recognised for her contribution to the legal profession by receiving a Lifetime Achievement Award at the prestigious Personal Injury Awards 2017. 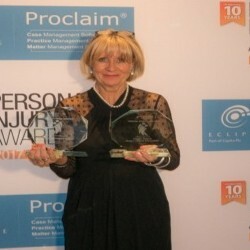 Maggie is recognised as a leading care expert and case manager with a reputation for excellence and was singled out for special praise at the awards ceremony in Manchester on the 29 November 2017. As a Registered General Nurse who trained at St Thomas's Hospital London, Maggie has over 30 years’ experience of providing expert clinical evidence on caring for clients who have sustained catastrophic injuries and also reporting on clinical standards. She is frequently invited to speak at national and international events. A published author, Maggie has written papers on the costs of care and is the specialist contributor author on Expert Care and Case Management in the APIL Guide to Catastrophic Injury. Driven by a passion to ensure that those with catastrophic and complex injuries are given the opportunity to live their lives to the full, Maggie also regularly organises annual trips for clients including Skiing, Surfing, and African Safaris, and in March 2017 took a ventilator-dependent client skiing in France. The award is deserved recognition of Maggies remarkable work and we are all very proud of her.